As you can see, opinions vary. There are a lot of ways to shift. The important thing right now is to find out what your DMV inspector wants to see. In Virginia we are highly discouraged from skip shifting (pretty much what Daniel was saying going from a high gear down to the gear you want in only one or two steps). So here we would have to progressively shift down to sixth to make that curve. You do whatever pattern you are required to do to pass your test. Each inspector will have their own opinions. Also as Eckoh said there may be times when you are coming to a complete stop in which case you can just use your brakes and then clutch in as you reach idle speed on the RPM. But the inspector is going to prefer to see you downshift. And if it is a light you are approaching then you definitely should have down shifted because you knew it was coming when you saw that yellow sign with a signal light painted on it right? Coming off an exit ramp on a highway you may need to skip shift to keep the vehicle under control but this technique also requires practice since the rev is a little higher on a skip shift than progressive. I personally haven't yet successfully skip shifted down, but I keep practicing. Downshifting is also my one remaining hurdle in school. I get better every day, but its the thing I need to just slog through and practice. CDL Schooling- Private vs Public? I chose a private school for similar reasons to Steve L. I also preferred private because I was able to visit before hand and get a feel for what it would be like. That helped calm my jitters. Getting on a bus for 24 hours and then going to school in new state with no familiar surroundings sounded just a little too scary personally. The school I chose to attend also had good class size and does not charge extra if you go past 160 hours of instruction unless you fail three times and even then its a modest fee. Some students have been here 7+ weeks until they were fully ready to test out and they didn't pay any more than the original tuition. Company programs won't be that generous. (neither will most private schools so do your research). Finally I really wanted to learn the generic way to drive, not a specific companies methods. I figured this would make me a better driver candidate. Since you already know about the High Road Training Program you shouldn't need to worry about the book material. So if you feel confident in your driving ability, and you expect to eventually drive for a company with a company school then it would sound like a company school is a good fit. But if you like a slower pace or just want to hedge your hiring bets a little more then private schools have a lot to offer as well. Just vet them carefully. Also as a curiosity, what kind of events (corporate, concert, theater, catering?). For the past year I worked as a repair and lighting tech for a corporate event company. Another reason I have heard from recruiters for companies that are phasing them out was that it costs $12k+ to install an APU per truck. And since the largest fleets swap their trucks out at 2 or 2.5 years the APU doesn't have time to make $12k back in savings or at least not enough for it to be worth it to the companies to maintain. Again this was from a recruiter so I don't know if thats even close to the real reason but it seemed to make sense. Just to add to that, a McElroy recruiter stopped by my class yesterday. He was extremely professional and had a great powerpoint that almost answered all of our questions before we could even ask them. They don't pay any type of fuel or safety bonus or tarp pay for a few reasons, one is that they realized people were being encouraged not to report accidents and to drive in unsafe ways to try to win the bonuses and two they decided to just put it all in to the base pay. Which at .44 is very generous. 70% of their loads are preloaded and pretarped so they don't have a tarp pay. 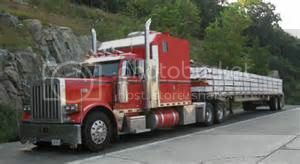 As mentioned before you are home every weekend, I asked if you wanted to take a load across a weekend if you wanted to keep rolling and he said only on Saturday or possibly if you picked it up Sunday night but they just don't allow drivers to drive Saturday night in to Sunday or holidays except extreme circumstances. They have a solid account with Lowes stores so an interesting bonus is that if you don't have a place to park the truck during your home time you can use any Lowes or Home Depot parking lot as long as the manager at that site is ok with it. That is something they have specifically negotiated for their drivers to be able to do. Those stores don't need to be in your home town either if you use your home time to go on vacation. Keeping in mind they are a regional carrier so you won't be getting dispatches too far from home. I didn't write it down but maybe someone who is more familiar can correct me but I believe they are also going or are already all automatic transmissions in their KWs. Thank you so much for that reply. I drew out the log book entries for what you described so I could visualize it better. That was exactly the puzzle piece that was missing to allow me to see how a week could transition back and forth like that without running over the 14 hour clock. From what it looks like you are running 11.5 hour days. So you can run that hard for six days and then you would have to re-start. But because you spent almost all of your on-duty time driving you were able to go far past what you would have been able to drive at 8.5 hours per day running only daytime and having to wait around overnight for shippers and receivers to be open. Though this all seems to depend on how amenable your receivers are to early deliveries and prompt unloading which seems to be more common with flatbeds (which are what I am leaning heavily towards). But I can see how it benefits any freight type if you are able to get in early. Once you hit this stride and the load planners see that you "get it" are they giving you loads that are scheduled to deliver at noon Wednesday or are they still leaving the full cushion to Thursday for delivery but setting up a pre-plan for Thursday morning when your hours are back? How tight will a load planner make a schedule once they know your running style? I really appreciate you taking the time to write that out. I have to say one of the things I am really looking forward to is trip planning. I really like problem solving and when I first seriously began to consider trucking it wasn't until I realized I would be able to use my brain that I was sure it was what I wanted to do. Excited to be out there soon and putting this invaluable knowledge to good use. Thank you again. I run through the night a couple of days out of each week, and I take all the loads I can get up into the North East. I'm on a 2500 mile run right now that finals in Connecticut, but I'm having to run through the night for two nights. Hey Old School, If you have the time would you mind posting maybe a simplified plan for that trip? I'm just curious how you switch back and forth between days and nights with HOS etc. Either way thank you. Thank you Old School. That is exactly why I hang out around here and use TT for the information I trust most. Attila, My take on this is that the one constant is everything changes. Look back twenty years, qualcomm, e-logs, strict medical cards, all changes. Trucking is always adapting. Profit margins are so slim and competition is fierce, and insurance companies will continue to drive many business decisions. As a former safety guy, I see it as only an improvement. If those in-cabs catch even a handful of drivers texting or falling asleep and get them off the roads, that makes it worth it to me. Sure, the SB is your home and I can understand not having anyone intrude there. But the drivers seat, thats the office and I've worked in plenty of offices with cameras before. And like Old School said, and I can personally verify having worked on the "screen" side of cctv before, nobody is watching you sit there. I do want to thank you though for bringing up an interesting discussion point. That is fascinating. Thank you for that explanation. Makes perfect sense. Saw a Melton come in to our yard at school today and I guess take a 30 while we were out backing today. Boy are those gorgeous tractors. The school I'm going to likes pushing TMC and Maverick but I really like what I've seen from the experience you've shared here. The "eye to the sky" coils normally require three straps each. Occasionally, we will run a chain in front of the front skid to act as the bulkhead. The chain would prevent the skid from............... skidding! Ah I see, thank you. 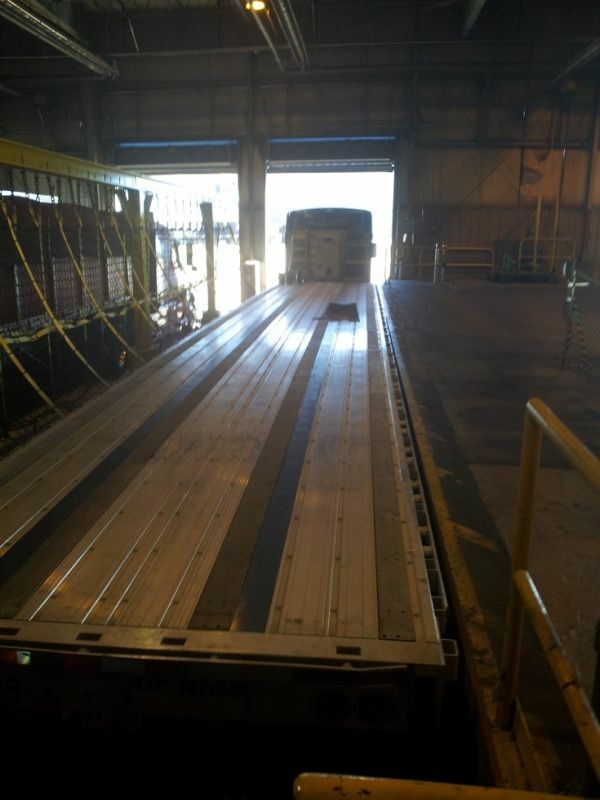 I think the most terrifying aspect of starting with flatbed is learning to do all the rookie driver things AND securement, but thats a topic of another thread at some point. On topic, do you or the shipper decide which direction the coils are going to face? I was watching a youtube video of two different flatbeds being loaded side by side with the same product and one trailer was loaded suicide and the other had the eyes parallel to the trailer. Here is one of my trips to the Alcoa plant. They want you to position the trailer close to the wall as they do a side load. There is fall protection on the driver's side. Those strap pads are a hot commodity. I try to collect as many as I can as they have many uses! I also had to tarp this load, but I guess I didn't get a picture of that. I guess this is what they mean by "rub rail"
Straps look really nice. So far I am really leaning towards flatbeds. I love seeing the loads and the hands on part. Did you need any additional straps across the front of the forward most coil or a bulkhead? Hey Cody Congrats on passing and good luck making your decision! Had a great day today. I passed my DOT physical this morning and I visited my first CDL school today, I will probably visit at least one more before making a decision. I am really glad for the information I have found on this site both for deciding between private and company schools as well as how to evaluate programs. I am leaving school names out because I really like that TT isn't a review or rant site and I don't want to promote or talk bad about any programs. I just wanted to mention a few things I found particularly useful during my school and company searches so far. Through reading some of the previous posts and blog articles on Truck Driving Schools and How To Choose A School I was able to compile a list of criteria that mattered to me and ask the same questions of each school I called. I discovered a few interesting things such as: A few schools do not have 53' trailers. One even said they have only one instructor and take 10 students per class. They consequently do very little road driving. Several do not offer final DMV testing on site. I also found it really helpful to ask about failure fees since some schools charge hundreds of dollars for retesting even after one fail and up to $1000 to repeat the program after 3 fails. Another school has no fees regardless of failure because they view it as their responsibility to the student to help you pass. So always ask questions! Another bonus for the day was stopping by two truck stops near one of the schools and spending a couple of hours talking to drivers about their companies. At first I was really nervous that I would be bothering those drivers, but every single one I approached spent at least a minute or two and sometimes much more letting me know how they felt about their current company and in a few cases their previous employers. Several said "If i could go back and do it again…" which was really interesting to hear about. I always made sure to ask them if they had a few minutes to spare, and at the end I always thanked them for taking the time and they were all very pleasant, and extremely honest. Overall I spoke with about a dozen drivers and got to speak with at least one driver from almost every company I am so far interested in. I would just like to say if you are thinking of doing this, do it. It has really given me information I could not find anywhere else, especially trying to weed through all the complaint posts littering the internet. It sure was great talking to such nice people, and if any of you that I spoke to today read this, thanks again for your time. And thanks for the great site Brett. I look forward to hanging out here often as I make my way through school and into the industry. Are you writing an article about EvE? That was my guess too. Not a real life trucker yet but so far as I have been told there is no autopilot. Perhaps there might be more boredom during a live load/unload or breakdowns and other downtime but not so much on the road. PTDI vs CVTA: is there a difference? I have noticed the same as well and I am also concerned about this. I also noticed some company sponsored programs are on the PDTI list, but only some of their locations (Swift). Is this an actual reflection of their other locations? Then all of this combined with some carriers that only hire from selected schools it seems difficult to make a decision on where to go for a non-company program.